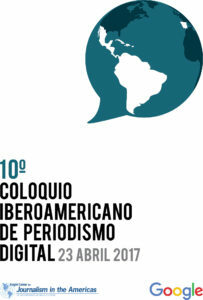 (*)For other coverage of the 10th Ibero American Colloquium for Digital Journalism, please see below. In a global context in which the demand for traditional newspapers decreases and in which the use of information and communication technologies grows, journalists are forced to develop ingenious ways in which to deliver their products. Especially in the last two years, much of the digital journalistic content is increasingly oriented to satisfy the audience that consumes news from their cell phones and from social networks. Likewise, the use of data journalism in new digital media is growing significantly. 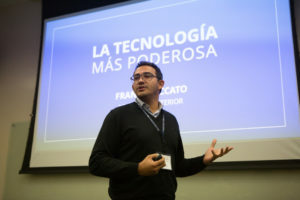 A large group of journalists from traditional and digital media in Ibero-America met on April 23 at the 10th Ibero American Colloquium for Digital Journalism organized by the Knight Center for Journalism in the Americas on the campus of the University of Texas, in Austin. The theme of this edition of the colloquium was: cases of innovation and sustainability in Ibero-American journalism. One of the participants of the second half of the meeting was Spanish journalist Borja Bergareche, director of digital innovation at Grupo Vocento in Spain. Bergareche gave the details of the Medusa Project, for which exclusive content was produced for mobile phones. To this end, a platform was developed for the treatment and reuse of automated databases to produce journalistic content. That is, through internet search engines, the platform collects specific data of some topic and generates content automatically, without the work of a newsroom. One of the products for mobile phones of this project was “info-playas” (info-beaches). Through this, it was possible to program the automatic sending of information to the readers of 8 media. The data sent were about weather, waves, wind, flags and surf of 600 beaches in Spain. Another panelist, Gastón Roitberg, from La Nación in Argentina, said that the newspaper is making a change in product, so that everything that is developed is more mobile-first. Roitberg said that his media outlet is in full evolution and digital expansion, in order to generate a novel experience with daily products. Also journalist Luis Fernando Bovo of the Brazilian newspaper O Estado de S. Paulo explained how this 142-year-old newspaper explores new technologies to maintain its relevance among readers. They have devised a product that has been quite profitable. This is the transmission of news via Whatsapp to subscribers. The newspaper sends three headlines of the most important news of the day and their respective summaries. This happens three times a day: morning, afternoon and night. And thanks to this, traffic to the newspaper’s site has increased significantly. Natalia Mazotte, director of Gênero e Número, commented on the difficulties that data journalism has in articulating a gender approach. The governments of Brazil and other countries in the region do not collect “official” information on gender orientation, so it is difficult for journalists to have data to analyze to inform public debate about, for example, transsexuals. Only with open data on gender, argues Mazotte, is it possible to influence the reduction of gender inequality. In a country like Brazil, Gênero e Número seeks to achieve this goal using short, contextualized and interactive articles and videos. For her part, Nela Balbi of IPYS Venezuela referred to the immense difficulties facing journalism in contexts in which governments hinder access to information. In Venezuela, the government of Nicolás Maduro has left aside many practices through which it used to disseminate official data. Today, only the official gazette is respected and publishes laws and decrees daily. With the collaboration of Transparencia Venezuela and the support of Open Society, the Vendata project, of which Balbi and IPYS are part, has been able to collect all the normative information available in the last decade and build a database that will be accessible to journalists, NGOs and academics, and in which the history and all details of government policies and programs can be traced. They will launch the database at the end of April. Natalia Viana of Agência Pública described her organization’s approach to supporting data journalism: they provide scholarships to independent journalists to produce stories of public interest – especially in the area of human rights. “Fake news do not have walls,” said Viana, pointing to the importance of having free content available to everyone. Agência Pública works for journalists to have the resources and time to develop articles and reports – published in various formats, such as podcasts and videos – of excellent quality. Marcela Turati, from Quinto Elemento Lab, commented on the difficulties investigative journalism faces in Mexico. Impunity in murders and threats to journalists makes the profession an unattractive option for new prospects, but also for area managers. There is, in that sense, an absence of editors. Quinto Elemento Lab was born as a space for journalistic research and innovation. Iván Slocovich Pardo, director of the newspaper Correo (Peru), explained the strategies with which the media outlet was facing the current complex context in which the incomes that the newspapers obtain by sales decrease consistently. Correo, part of the conglomerate Epensa, has separate editions in numerous localities throughout the country. This provides a comparative advantage for the newspaper over national media in which news predominates about only the problems of the capital. But it also involves challenges. When Slocovich Pardo arrived at his post, each of the offices of the newspaper was handled with some independence so that even the news about the national level was produced in each locality. Implementing a convergent newsroom strategy has allowed the newspaper to optimize resources and be more efficient. Likewise, they have established agreements with universities and institutes to facilitate students of journalism and related careers creating content that can be used in the newspaper. Paula Molina, from Radio Cooperativa in Chile, told about the challenge of innovating journalistically in one of the most traditional and historical radio stations in the country. Molina said they decided to make the daily podcast “La historia es Nuestra” (The story is ours) of which she is the host. Taking advantage of the depth this format allows, and integrating the immediacy of the radio, could also expand its thematic palette, Molina said. Cinema, sports, music, science, trends and news are the issues addressed in the podcast and are also often promoted in its social networks. In producing the podcast, Molina explained, they have found new ways to relate to their audience. They have also learned to use radio resources in a variety of ways, while at the same time acquiring other skills – more technical – to do their jobs. Daniel Dessein, presented the experience of La Gaceta de Tucumán, one of the Argentine newspapers with the largest circulation at the regional level, and the fourth at the national level. Dessein revealed that they continue in the effort to make the newspaper more profitable and more committed to its audience, making more digital products. Also, for two years they created a digital native daily in Salta, and are considering opting for a paywall. The latter will enable them to better understand their loyal readers, Dessein said. 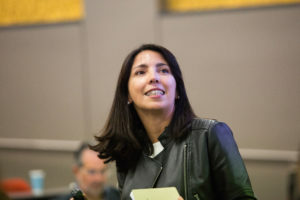 In turn, María Noel Scanarotti, audience editor of the Clarín newspaper of Argentina, presented the details of the mobile-first experience of her media outlet. On the occasion of the presidential elections of the USA in 2016, Clarín decided to create multi-focused mobile coverage, with support of its website and its social networks. Through a bot, between Nov. 8 and 9, they made a dynamic of questions and answers about the controversial statements that the then-candidate Donald Trump gave during his campaign. The impact was positive, Scanarotti said, because on Nov. 9, Clarin had 2 million unique browsers and 5 million page views. This made it possible to generate a new audience, the journalist explained, and led to more users willing to subscribe to Clarín to receive notifications. With this they also noticed a change in the habit of news consumption, she concluded. Margarita Funes, of the daily La Prensa Gráfica, of El Salvador, told the newspaper’s experience regarding the consumption of news in social networks. These have modified the demand for information, the style of reading news, and the time to inform, she explained. The only thing that should remain solid is journalism, Funes said. That is, the reporting, verification of sources, responsibility in the management of information in all its genres, she noted. Franco Piccato, from Argentina’s La Voz del Interior, said that the best technology ever created to innovate and create sustainable models for journalism are people. “If people are not the protagonists of change, the organization will not change,” Piccato said in his presentation. Elaine Díaz, director of Periodismo de Barrio, Cuba, said that in order to launch her site in 2015, they campaigned for fundraising through PayPal. As a result, contributions from 60 donors made it possible for them to finance their journalistic proposal, even amidst the editorial, economic and political limitations that characterize the country. What they are looking for, Díaz said, is to promote the conditions of a constitutional reform in Cuba so that these types of journalistic initiatives are not criminalized. 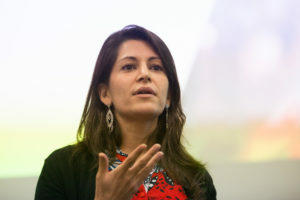 Alejandra César, from El Financiero in Mexico, revealed that when they started as a media outlet, they had less than half a million users. Today they are around 7 million. They bet on a constant restructuring, assigning work teams to specific products and themes, but without stopping working together as team. Most of the journalists and speakers at the colloquium agreed that the news media should have all of their areas working in unison, together. In order to reinvent in this era of technological change, for new formats to reach new audiences and to recover lost trust among readers, the business, editorial and technological area must be involved in this process. As for successful innovations in business models that sustainably finance a medium, Brazilian journalist Fernando Rodrigues recounted the experience of Poder 360. Rodrigues commented that before Poder 360 had its own website, its newsletter with reports on Brazilian politics was sold to companies, through subscriptions. That managed to finance the launch of its website on Nov. 22, 2016, which now has 18 journalists in its newsroom. To “break the bubble” you have to tell the story differently, use humor and try other formats, said Knight Center director Rosental Alves, who led the colloquium.